12:44 I did not take the rebuy on the 11:34 TideTime because it was not selected by my software as a TradeTime. But it would have been good. 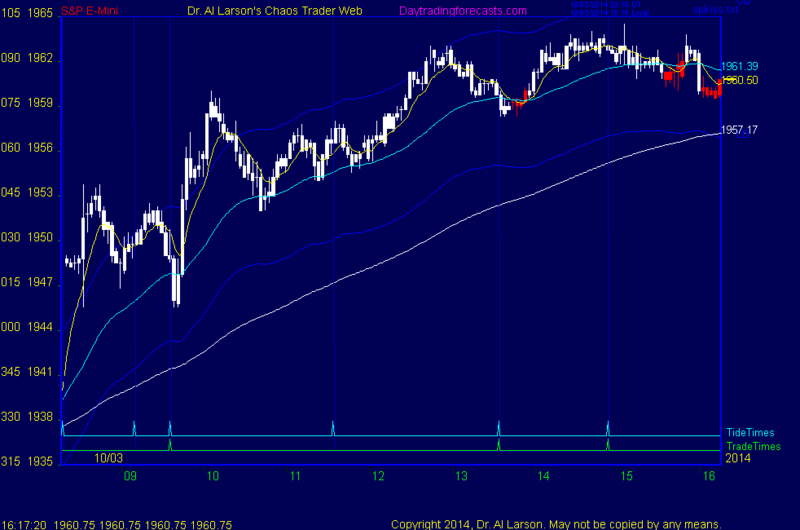 9:32 yesterday's low ended a multiday down Fractal of Pi. That produced a rally into this morning. Now the market hast to digest that, so today looks like a congestion. 10/3/2014 10:51:16 AM MT BBB****:: Hey Al and all, been away awhile - hope all is well. Nice trades today Al. 10/3/2014 10:49:58 AM MT V:: if i may ask the reason your trade time is different than the tide time @ 11:34... also why was the tide marked at 11:34 when the tide pokes a little later around 12:15? 10/3/2014 8:26:43 AM MT V:: thx... as you got in at 51 what were you looking for to signal you into that trade...as the close on the 3 minute was at 53 on my chart: http://screencast.com/t/otU6UYgLu thanks for the help. 10/3/2014 8:01:01 AM MT V:: on the continuation buy the Al just had.... is that a pull back to the 110 then a close back in the long direction... i understand the KISS to wait for the 20ma to cross the 110..but just wanted to double check on the continuation trade.